Exactly one year ago, we launched Antidote Match, the first truly patient centric clinical trials search tool (see an example at the bottom of the post). Match aggregates and annotates all trials listed in clinicaltrials.gov to make it easy for people to connect with medical research regardless of their condition on the sites they already know and trust. The first search tool to launch on a website other than our own was on the blog of a health advocate who came to us through our partnership with CureClick. CureClick aims to increase clinical trial awareness and accelerate patient recruitment by enabling influential members of online communities to easily find and disseminate accurate, patient-friendly information through their social networks. Using our technology and CureClick’s network of online influencers, we are able to spread the word about the need for patient engagement in medical research. 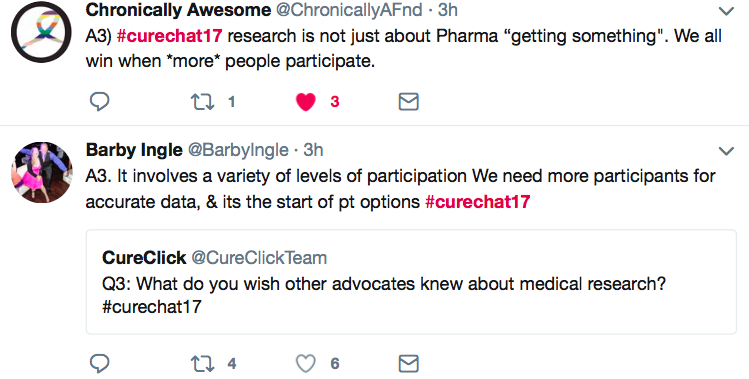 To date, 78 CureClick Ambassadors have brought our search tool to their communities to help people connect with clinical trials that are a good fit for them. We are almost at our goal to bring our free service to 100 influencer sites and blogs by the end of the year. • Patients want to be involved in discussions about medical research. Engage them early and engage them often. People want to be heard. • There is a real desire to see results – even null findings – from all research. • We need to do a better job of involving people of color in research. • When done right, everyone benefits from research. It isn’t about pharma companies getting something from patients, but rather a mutually beneficial exchange. To see the full summary of the chat, please visit this link or jump straight to the full conversation here. Thank you to the CureClick team and the influencers who took the time to participate and who work so tirelessly to advocate for medical research. We are so grateful for all that you do.